Making over your garden is one job that you will thank yourself for come summer time. There’s nothing quite like some al fresco living of an evening after work or on a sunny weekend and a beautiful garden space makes the prospect even more tempting. 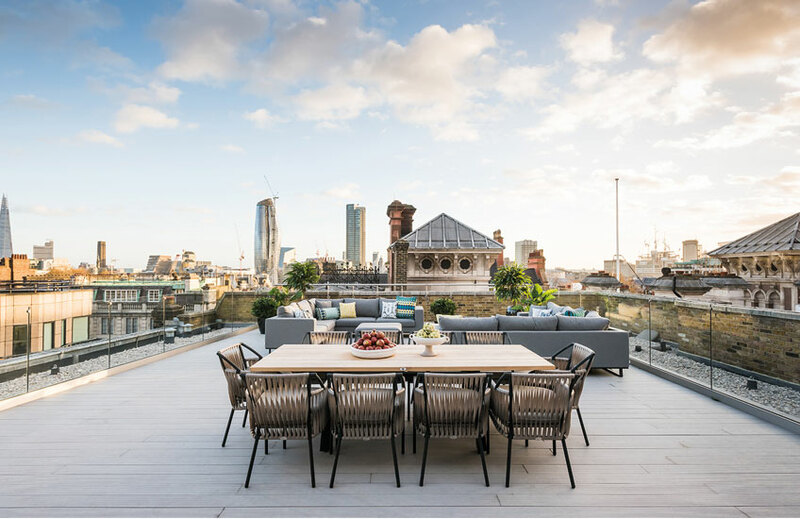 Prepare for an influx of outdoor space ideas from our favourite designers, from London townhouse terraces to island paradises. 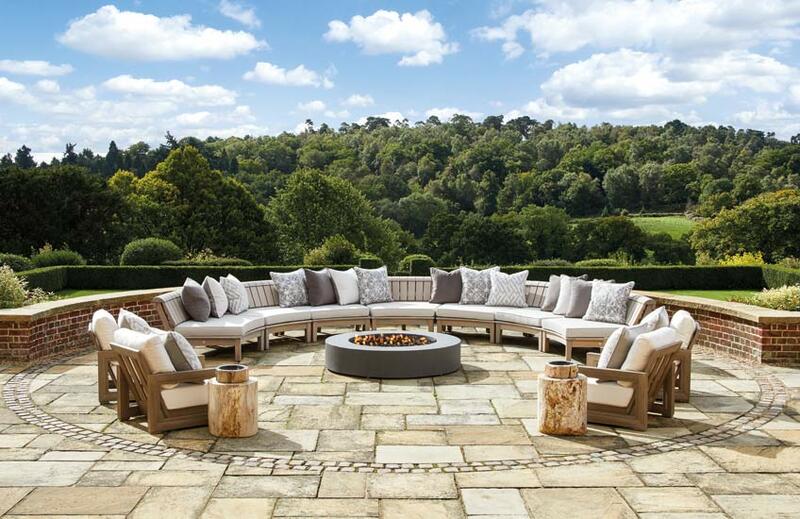 Read our Outdoor Furniture Buying Guide for more useful advice and tips. This effortlessly serene seating arrangement showcases the impact an outdoor space can have when it’s wonderfully well-designed. Laura Hammett uses a perfectly livable tonal palette of ivories, creams and dove greys alongside pretty decor, proving that it’s not just an option to decorate your outdoors with vases, baskets and throws like their indoor counterparts – it’s a necessity. Shop the collection which it inspired here. 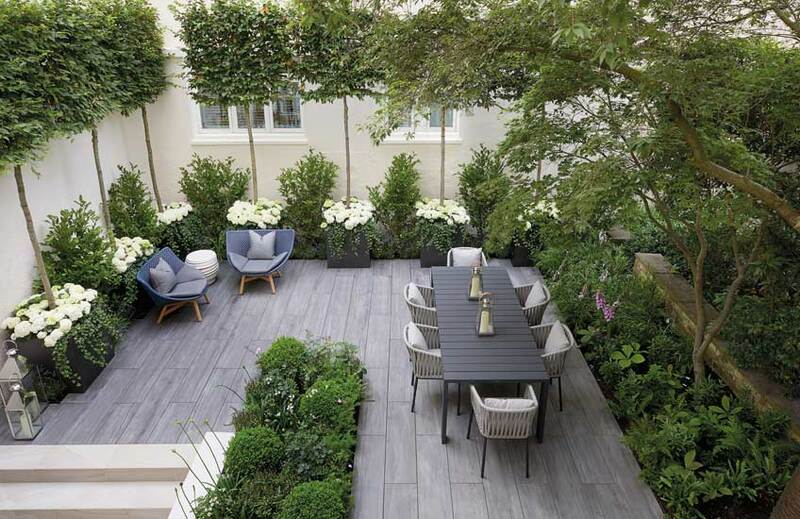 A unique feature for a city home (especially in the famed Eaton Square), a London courtyard calls to be seriously taken advantage of. 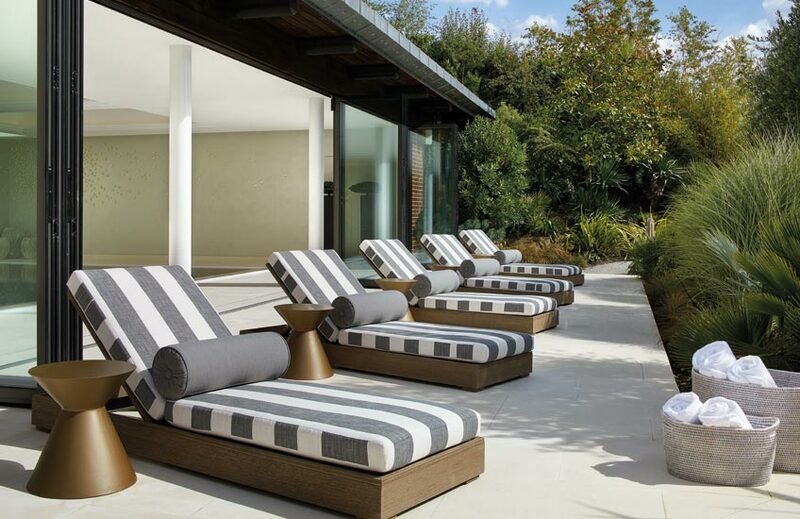 To make this home’s outdoor area something special, Finchatton landscaped the space to create a lush, multilayered environment and then decorated with a modern ash grey flooring and contemporary garden furniture. A contemporary secret garden at its finest. Helen Green chose an impossibly fresh al fresco vibe for this city aerie with updated wrought iron seating decorated with brilliant white upholstery, a smartly trimmed hedge for a touch of nature and simply glamorous golden pots. Mismatched patterns play on the cushions to soften the formality of the space. 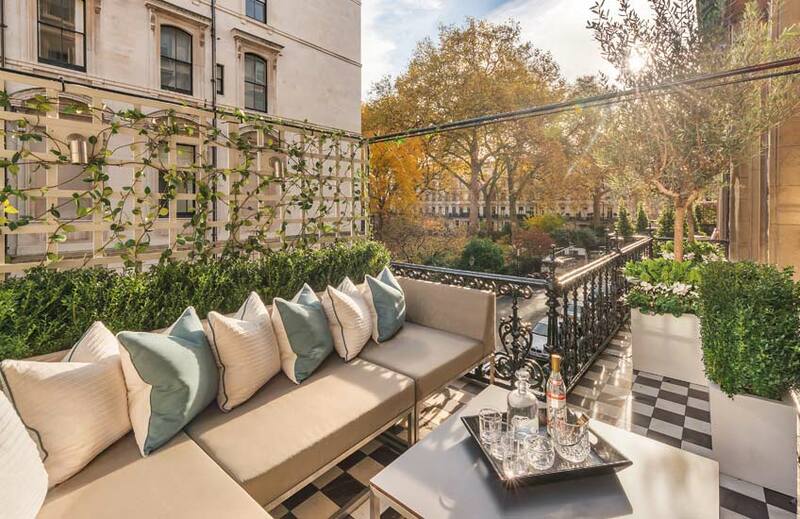 Katharine Pooley transforms this quintessential London square balcony with beautiful trees and a chic sofa and table set finished with alternating white and seafoam green cushions. The black and white chequered flooring is the ultimate London look. Inspired by his clients’ love of family and traditional sensibilities, Jordan Carlyle of Carlyle Designs transformed a New York Chelsea penthouse into a sky-high home which bridges the gap between urbane city living and transitional sophistication. “The biggest highlight of this project was that we had wonderful clients who allowed us to have complete creative freedom – that enabled us to play with all sorts of textiles, wallpapers, and furnishings. 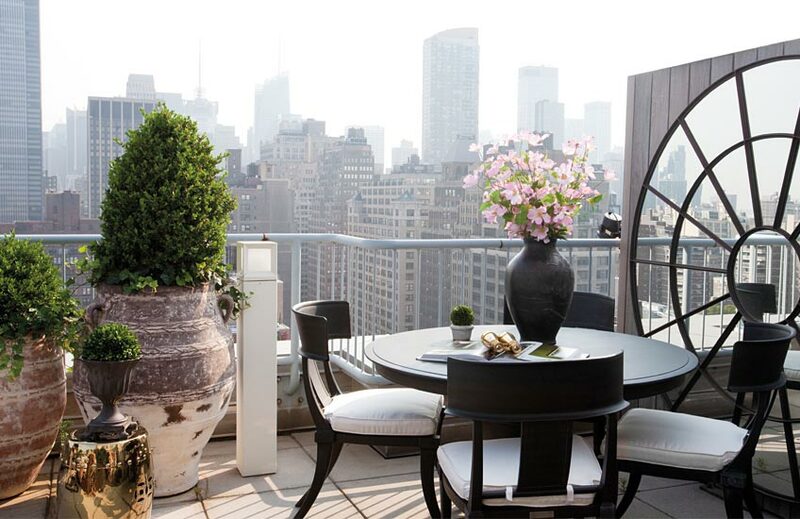 The end result was a sophisticated transitional paradise on top of Manhattan.” The transitional style extends to the home’s outdoor terrace which includes comfortable couch seating, an oversized circular mirror which reflects the city skyline and a dining set complete with elegant klismos chairs. 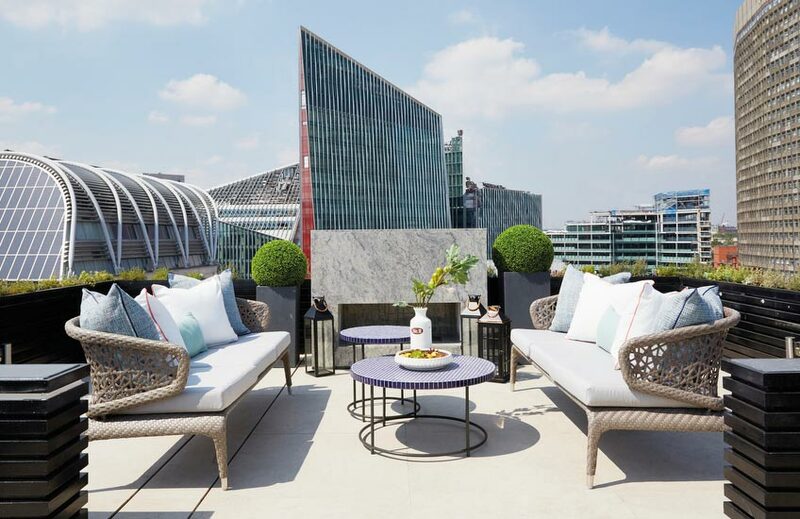 Although A.LONDON’s minimalistic approach to this terrace allows the iconic city skyline to do the talking, the furniture choices are far from simple. 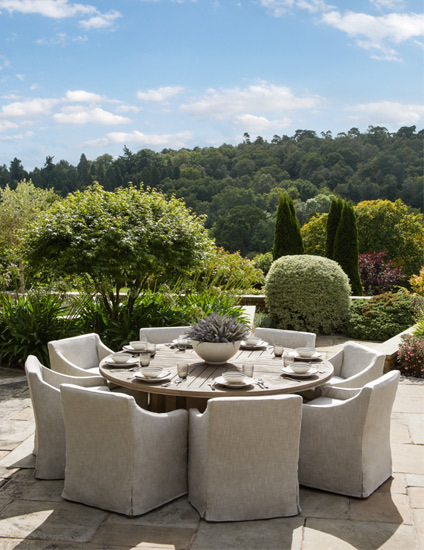 A unique dining chair made up of twisted bands and a barely there frame adds just the right amount of texture whilst two capacious corner sofas, accented with vibrant outdoor cushions, provide plenty of apres-dinner seating. 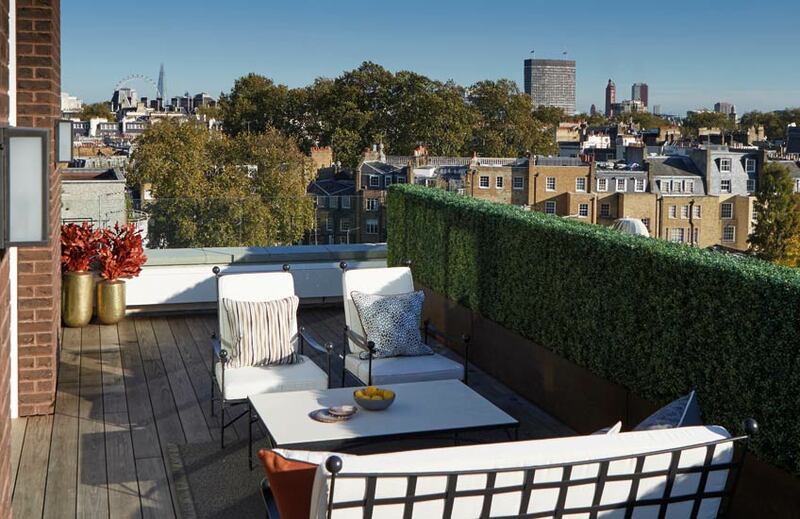 A.LONDON added texture to this rooftop venue in the form of the unique, contrasting weave of two facing sofas. The geometric pattern of the weave and its oatmeal colour palette stand out against the rooftop’s glossy black woodwork. Oversized lanterns and planters, a wireframe table duo and a beautiful stone fireplace were chosen to elevate the look further. 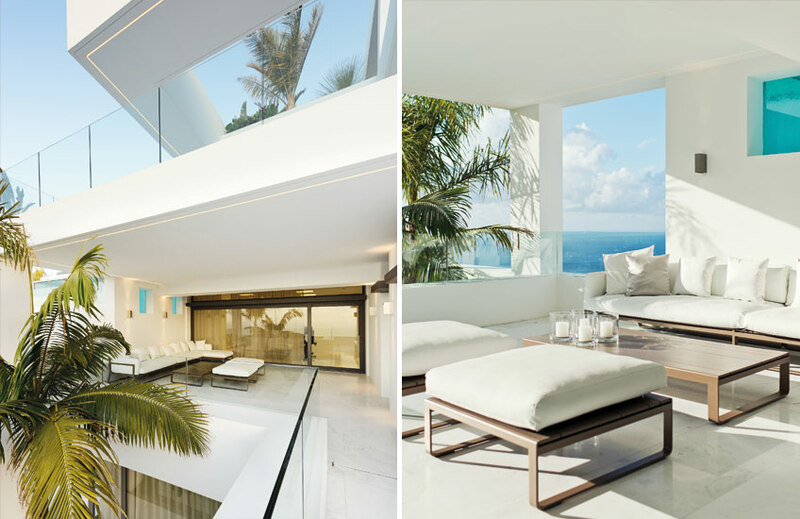 Designer Eric Kuster sticks to a palette of white, white and white with this Altea Beach residence and the effect is one of luxurious simplicity. Kourtney Kardashian’s former home featured a heavenly seating area in its entryway. Created by Jeff Andrews, the space plays on its fresh white backdrop with capacious skirted outdoor armchairs in a white linen-like outdoor fabric. 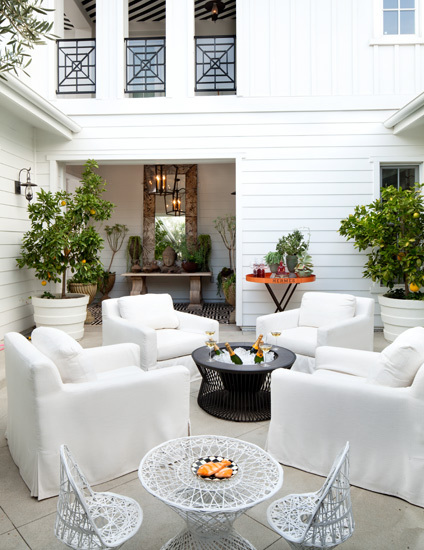 A slick black ice pit, white rattan bistro set and lush citrus trees ground the seating area. "The outdoor space of Kourtney Kardashian’s former home reflected her minimalist but comfortable tastes." Can there be anything that epitomises Beverly Hills more than an expansive garden with towering palm trees, set behind a spacious mansion? 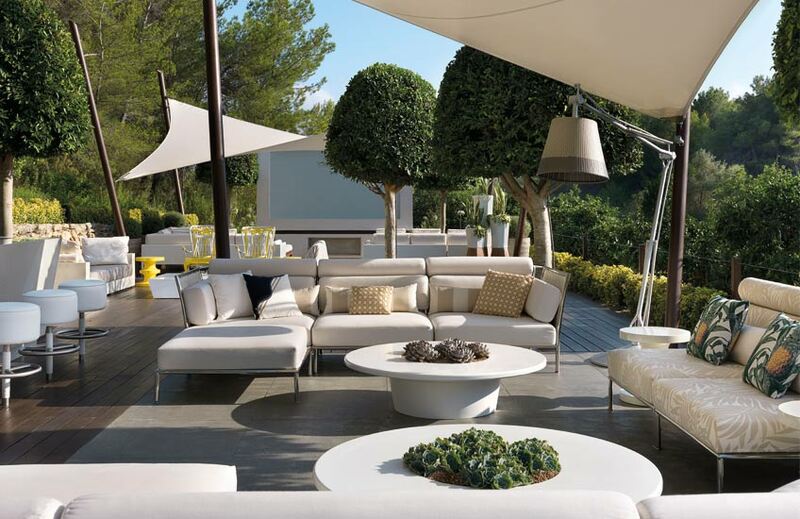 The home’s monochromatic scheme is mirrored in the outdoor furniture arrangements. A wood-like frame upholstered in a white outdoor fabric is the quintessential outdoor furniture for brilliant white Mediterranean villas. 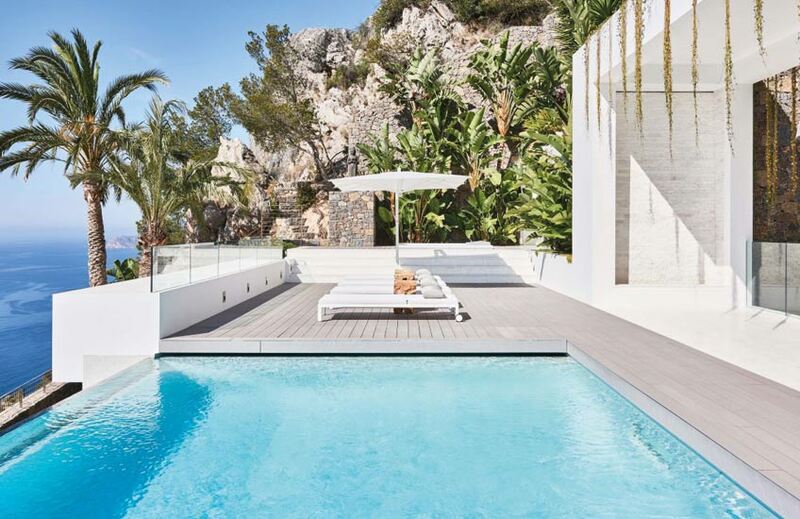 Eric Kuster pairs plush cushioning with simple lines for an ultra-modern aesthetic which suits this property’s Spanish cliffside locale. 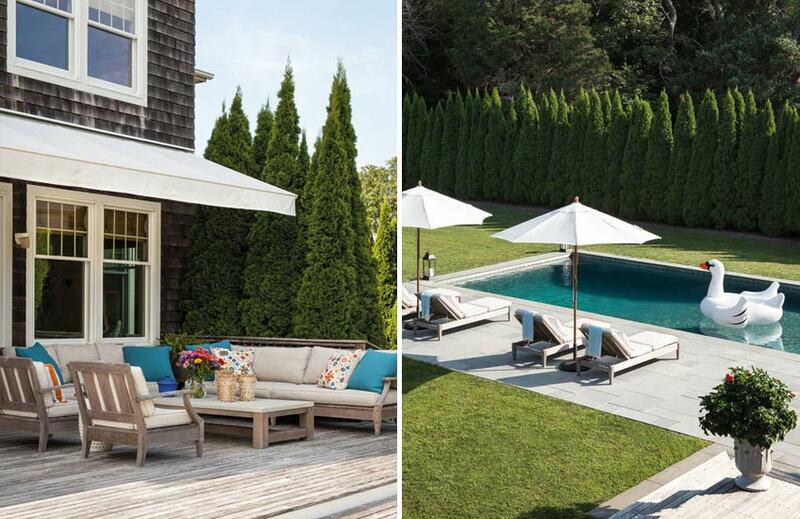 With such a glorious backdrop, Jennifer Post chose to accent this lush poolhouse area with classic white loungers and a blue and white seating ensemble, which pays homage to the white-trimmed and clapboard-clad Dutch Colonial style of its main house. Minimalism reigns supreme in a Hollywood Hills raised terrace. Taking inspiration from the home’s clean lines and architectural forms, each area of the terrace is given its own function, whether dining, hosting or relaxing, and is kept uncluttered and simplified. In the foreground, a singular dining table set stands simply before glass railings, which allow an uninterrupted view of the garden below. A mirror set on the back wall is used to emphasise the garden’s size in a clever design move. For her own Balearic villa, designer Brigitta Spinocchia-Freund spared no effort in creating inviting and varied outdoor spaces. Here the seating area is flanked on one side by a bar; elsewhere on the property are a meditation and spa complex and a children’s garden modelled after Tim Burton’s Alice In Wonderland. 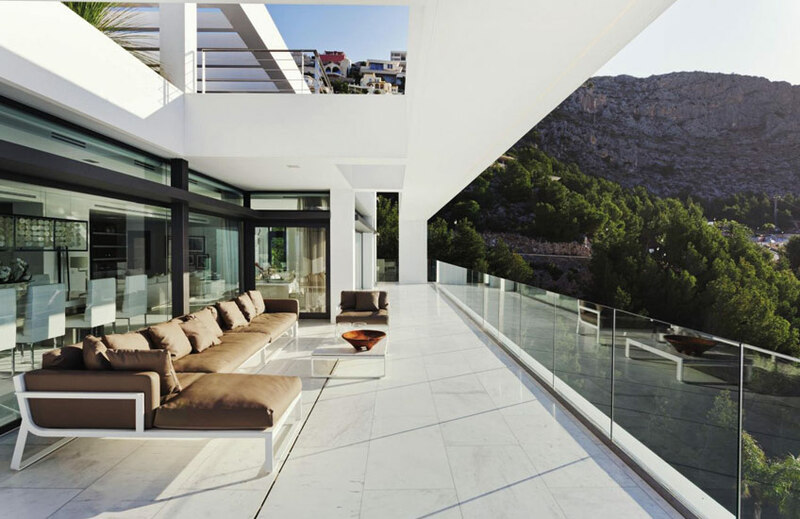 The views of this Altea cliff house demanded a frontal seating arrangement along its expansive balcony. Designer Eric Kuster incorporates an expansive sofa which perfectly blends into the nature which surrounds it. "Upholstered dining chairs instantly elevates this circular dining arrangement." 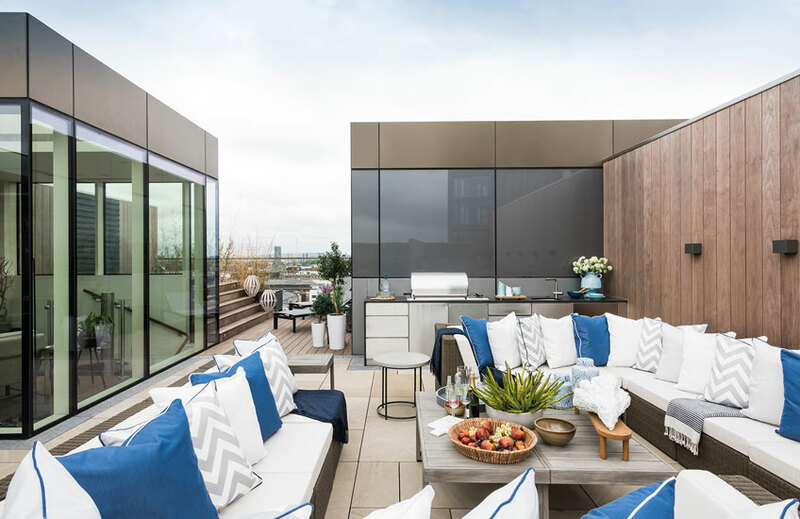 If you prefer to keep your interior living spaces fairly neutral then your outdoor living space is one where you can play with a little more colour. We love a classic blue and white palette – it’s fresh, it’s timeless and it’s undoubtedly a palette favourite.